Silk Roads Sites in Uzbekistan is part of the Tentative list of Uzbekistan in order to qualify for inclusion in the World Heritage List. I visited this tentative WHS in June 2017. Uzbekistan was very crafty with this tentative site. They left the very obvious Samarkand, Bukhara and Khiva out of the Silk Roads Sites (no double listing), but then they included all the separate tentative sites put forward in 2008! A sort of fallback position, seeking a series if individual inscription fails! Of the list I visited the ones near Bukhara: Chasma Ayub Mausoleum and Chor Bakr Necropolis (already reviewed) + Bahoutdin Naqshband Necropolis (photo). I think it would be interesting and useful to have all these sites + other sites in Asia work together to have 1 transnational inscription for all these sites instead of having one series for every country. Uzbekistan has selected 18 locations to be part of the international Silk Road nomination. They include archaeological sites of trade centers, buddhist temples, a citadel, a caravanserai, stupa's, mausolea, minarets and medressahs all over Uzbekistan. They do not double the current Uzbek WHS of Samarkand, Bukhara and Khiva by the way (though all of Silk Road fame). 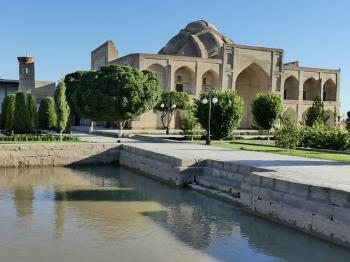 On my recent trip to Uzbekistan, I visited 2 sites out of these 18: Chor-Bakr and the Bahoutdin Complex. Both are located a few km's outside of Bukhara. Chor-Bakr is a 16th century necropolis, containing the family tombs of Abu-Bakr-Said (related to the Prophet Muhammad). From the 19th century on the site was developed further by adding a mosque, a khonaqo and a pretty little minaret. At my arrival at 9.30 I found the place deserted, except for a couple of parading peacocks. The complex anno 2010 has come a long way from this quote from my 1996 LP Central Asia ".. there's little sign of recent restoration". Chor-Bakr now looks as polished as all monuments in Bukhara. They even already have a Unesco sign! It is definitely a worthwhile site to visit though, very large, intact (or restored to look like that). The Bahoutdin Complex is a much more lively site. This is an important Sufi shrine that attracts lots of locals. It houses the tomb of Bahoutdin Naqshaband, the 14th century founder of one of Central Asia's most influential Sufi orders. The complex around the marble tomb of Naqshaband has several lovely features. There's a neat turquoise pavillion, around which people circle 3 times for good luck. The same goes for a dead tree trunk on the grounds, under which people have to crawl. The site is quite spacious and is adorned by beds of roses. It is a pilgrimage site in action, but not too strict. Both local and foreign women enter with short sleeved shirts and without a head scarf. There's an ice cream seller on site, and people stroll around in groups or families just having a day out and taking photos. In retrospect, this was one of the most impressive sites that I visited in Uzbekistan.